James Bond head to Japan to find the true culprit behind the attacks out in space and prevent a nuclear war breaking out. 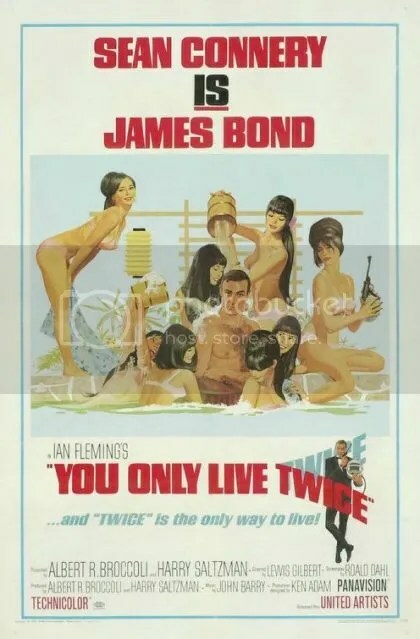 So my Bondathon has continued and taken me to You Only Live Twice and I must admit that it is probably the poorest from Connery. Not in the sense of Connery as Bond he still has plenty of very amusing and naughty lines. Some of which I am sure you would not get away with saying now, like being out in Hong Kong and telling the girl she tastes different to a Russian girl and mentioning Peking Duck and Caviar. You have to laugh at that though, possibly more now than when it was actually released way back in 1967? My favourite scene certainly had to be the helicopter chase, it was done so well and was very exciting from start to finish. Something that every Bond film has to have, a helicopter certainly does add to the suspense and just that little bit more thrilling than other chases. Could possibly be because I found my one and only experience of being in a helicopter rather scary in all honesty. While that was a good part, I have to say the whole Bond pretending to be married and a regular Japanese man being very crazy. Are we actually also supposed believe that and fall for it? So with all of that in mind I think this is my least favourite of the Bond films so far, remember to check my progress here. I can totally understand why Connery left (and then came back) after doing this one in all honesty. It really was a let down considering the brilliant films he had already appeared in. Just think parts of it were boring and rather drawn out, not enough of the charm of the other films. I do really enjoy the relationship between Bond and Moneypenny though she certainly never gives up with him. Connery really does carry himself well as 007 though, his falling from buildings onto something pretty soft was a good moment. Especially how pleased with himself he looks as he walks away adjusting his cuffs only to miss someone behind him and getting knocked out from behind, will he never learn with getting too cocky? Probably not but that is all part of the charm. I won’t be rushing to watch this one again, I think that is probably the best way to leave it! One of my least favourite Bond’s. I agree it is the poorest Connery although I’ve met many who prefer this one to Diamonds are Forever. Enjoy your Bond-a-thon! I finished mine this August. They are some epic movies. When you’re done you should rank them 1-24 like I did. It’s quite a task!!! I’m thinking it might be a good idea to start ranking them now and fitting them in as I go? Oh well I don’t have long to find out what I think of Diamonds are Forever! Funnily enough I just watched this at the weekend! I actually rate YOLT quite high but it’s taken a few viewings for it to reach those heights – there was a time when my opinion of the film was less favourable. But, it’s really grown on me! That’s interesting that it has grown on you after a few viewings! My fav of Connery’s era, personally. Blofeld is just the best! I will admit I think my love for this film is helped a lot by nostalgia. One of my first memories is actually being really scared of Blofeld’s scar haha! Haha that’s brilliant! I think the fact I’ve waited so long to catch up has an affect on these films in all honesty. The whole sequence with the “turning Japanese” and being trained by ninjas felt like the beginnings of Moore’s silly Bond. Totally agree with you! Still can’t quite believe they went down that route!